*We live in Colorado and have visited Mt. Evans for years. 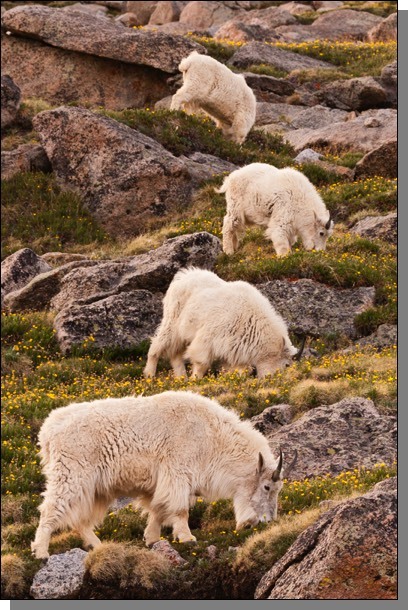 *Mid to late June is our favorite time of year to photograph the mountain goats. *The nannies are just introducing their newborn kids to the herd, so there is lots of interaction going on. *It's late enough that winter storms are unlikely to close the road, but many of the goats still have thick winter coats. *On top of that, the alpine flowers are beginning to bloom, and the surrounding peaks are dappled with snow. The region above timberline is one of the most visually exciting habitats to be found anywhere. There is little to impede your views of the snow covered peaks stretching toward the horizons, and colorful flowers decorate the tundra at your feet. Throw in a variety of wildlife, and a nature photographer couldn't ask for much more. On this tour we'll be concentrating on Mt. 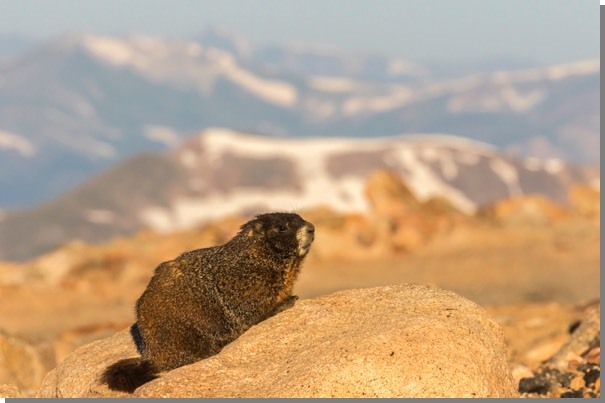 Evans where the highest paved road in the country provides relatively comfortable access to some of the most incredible examples of alpine tundra to be found anywhere in the world. There is something for every nature photographer on the slopes of Mt. Evans. Landscape photographers will have the endless Rocky Mountain vistas as well as an ancient bristlecone pine forest. Patterns of multi-hued lichen and a carpet of alpine forget-me-nots, spring beauties, alpine avens and a variety of other colorful flowers will tempt close-up specialists. Then there's the wildlife. 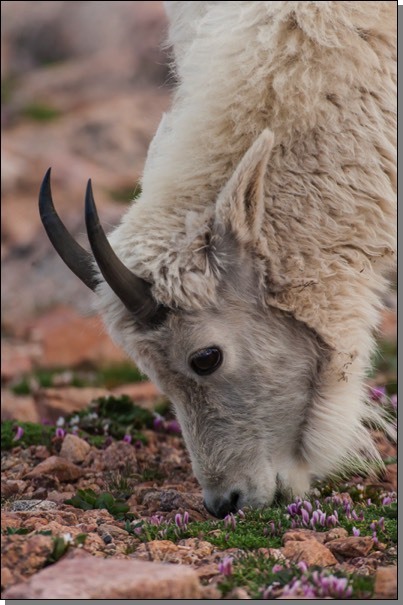 Bighorn sheep, marmots, pika, ptarmigan and of course the mountain goats will compete for the wildlife photographer's attention. 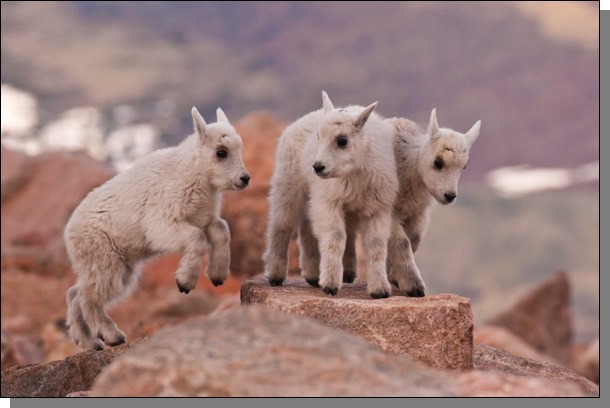 The mountain goats on Mt. Evans are some of the most accessible and highest ranging in the world. In June, the goats will still be in good coats, and the new born kids and their mothers will be joining the main herds. 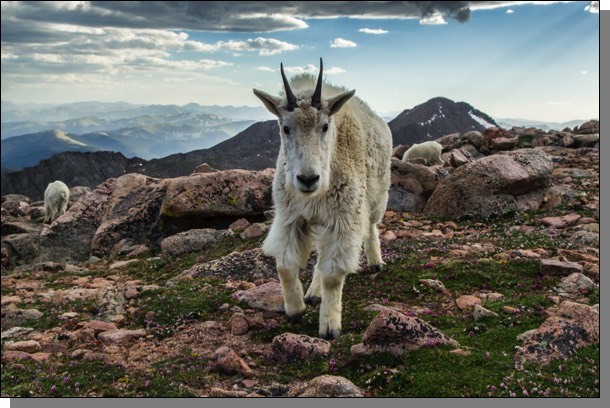 This will give us fantastic opportunities for everything from point-blank portraits to mother/kid interactions to environmental shots showing the goats and their magnificent world. 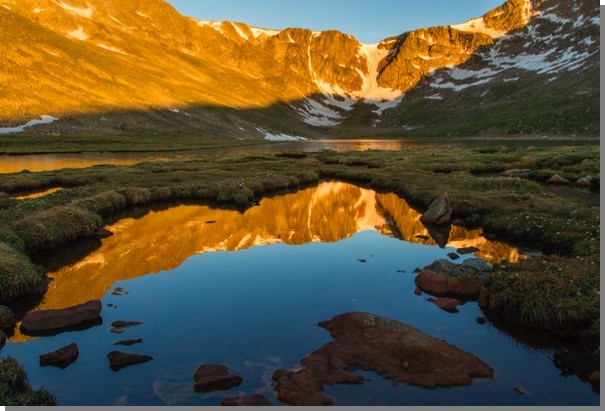 In most parts of the world visiting the alpine tundra requires considerable exertion, and your heart and lungs offer plenty of incentive to leave heavy camera gear behind. If you've ever wanted to explore this challenging terrain with lots of camera gear, this is the tour for you. Day 1: Pickup at Denver International Airport, check into motel in Idaho Springs, afternoon shoot on Mt. Evans, dinner. Day 2 & 3: Morning shoot on Mt. Evans, breakfast, slide critique and/or nap time, afternoon shoot, dinner. Day 4: Morning shoot, breakfast, return to DIA.